Beeton's Christmas Annual was a paperback magazine printed in England yearly between 1860 and 1898, founded by Samuel Orchart Beeton. 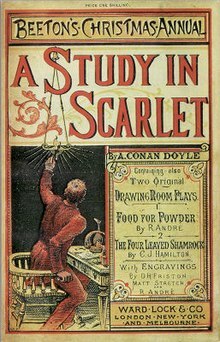 The November 1887 issue contained a novel by Arthur Conan Doyle entitled A Study in Scarlet which introduced the characters Sherlock Holmes and his friend Watson. ^ Stock, Randall (24 May 2010). "The Best of Sherlock Holmes – Beeton's Christmas Annual 1887: An Annotated Checklist and Census". Retrieved 1 July 2010. ^ Wolfreys, Julian (1992). "Introduction". In Conan Doyle, Arthur (ed.). The Adventures of Sherlock Holmes. London: Wordsworth. pp. v–vi. ISBN 1-85326-033-9. Wikimedia Commons has media related to Beeton's Christmas Annual. This British magazine or academic journal-related article is a stub. You can help Wikipedia by expanding it. This page was last edited on 18 March 2019, at 03:37 (UTC).